This article series is for anyone that missed the boat on maximizing value from previous Standard staples. If you’re the average player, to stay competitive in Standard you have had to keep certain cards from Standard up until the last second – even in those final months before a block’s rotation. You know that the cards will go down, but you are forced to hold onto them in order to stay competitive. It is common that players will lose a good chunk of value on cards they’ve held up until rotation. In this case, the block in question would be Innistrad. What many Standard players may not realize is that even though a card has rotated and they’re left holding the bag, it can still have a life beyond Standard – Modern, Legacy, Commander, and even just general Casual play can still allow a card to maintain or develop a surprising price six months or a year later. Don’t get me wrong – $30 Huntmaster of the Fells are never going to happen again. Looking beyond that though, there are opportunities for many other cards you may still own. Let’s review my top cards from the Innistrad block that have left Standard recently and see what you can do with those leftovers. I will identify what format the card will be desired in (Modern, Legacy, Vintage, Commander, Casual) and why I believe the card will retain value due to this demand. Today I’ll start with Innistrad, and next week I’ll cover Dark Ascension and Avacyn Restored. Army of the Damned was a terrible, terrible card in Standard. This is why it still sits in your binder – there was simply no place for it in the Standard metagame. On the other hand, if someone is playing Black in Commander, you can bet that they either have this card in their deck or will want to include it in the future. I expect this card to increase in value over time as Commander players recognize its raw power and add it in decks accordingly. The combination of its evocative flavor and its power in a slow format like Commander make this card a good long term hold. Dragons are a fan favorite and players that have a fascination with the creature type like to collect them. Mythic rare dragons always deserve careful consideration due to this casual appeal. I believe that Balefire Dragon has a powerful ability that fits in with a Kaalia of the Vast Commander deck, a popular general due to her synergy with two all-star tribes. Balefire Dragon was also a Standard dud but has the potential to retain its value and increase over time due to casual and commander demand. Garruk is the first Standard powerhouse in this list. Commanding an initial price of $30+ when first spoiled, this incarnation of Garruk got to work quickly making his presence known to the Standard metagame. Eventually, this version of Garruk was joined by the Primal Hunter, and both took turns being the best Garruk that Garruk could be over the next several months. In Modern, I believe that Garruk Relentless has potential. He is a solid planeswalker that can fit into multiple strategies especially because of how easy he is to splash. He is additionally a good Casual target because he is the first transforming planewalker, which makes him unique. If you’re still holding onto a few Garruk Relentless you very well may see these slowly creep back up over time. Geist not only was a Standard powerhouse that was the key role player in Bant Hexproof decks, but was adopted early on in Modern and Legacy strategies as an uninteractive powerhouse attacker. 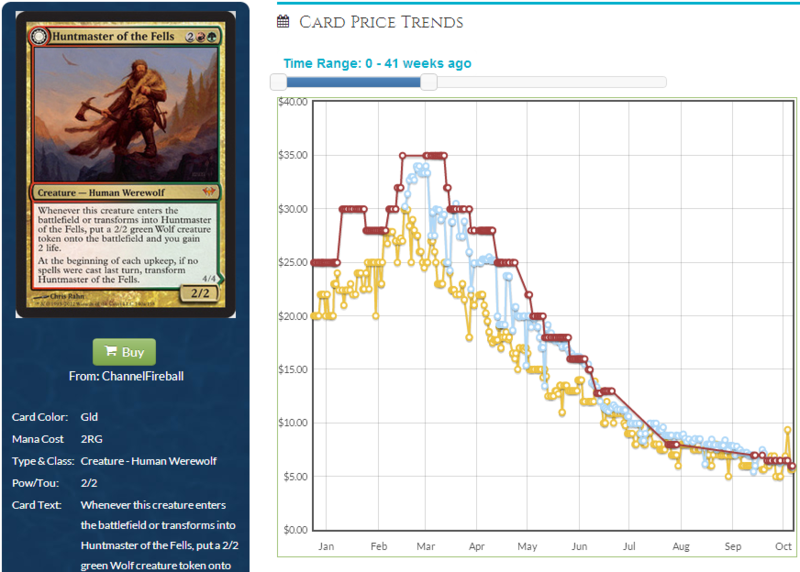 Geist of Saint Traft may have dropped down in price on its way out of Standard, but do not expect him to stay below $15 for very long. Geist has an efficient body and a powerful ability. I expect to see a lot of this card in the future as he is played in tournament tables and casual tables alike. In fact, I would recommend picking up extra copies of this card if you can while he is down from the Standard rotation lows. If any card on this list is expected to go up, Geist of St Traft is definitely in the top five. This is a great spec target moving forward. Grimgrin was never good in Standard but I knew plenty of people that built Commander decks around this Zombie Warrior legend. I don’t really expect this card to ever break $5, but I doubt it will ever be bulk either. 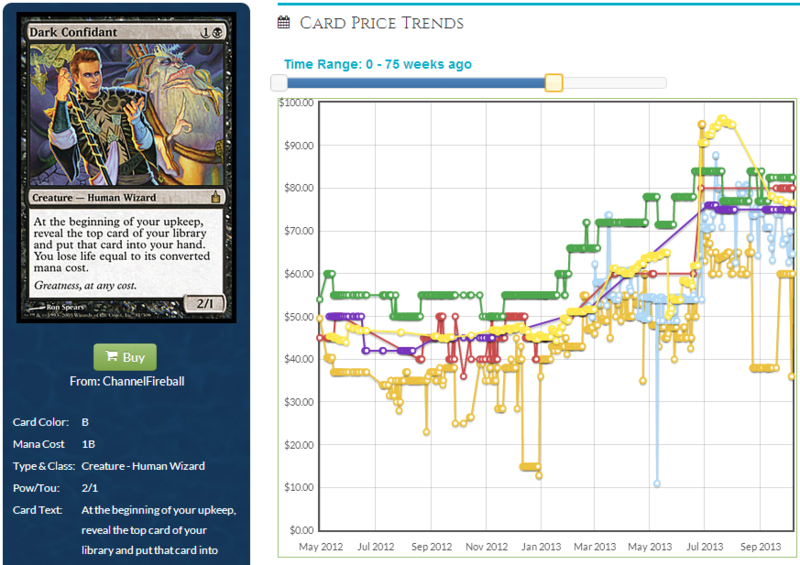 I see it slowly creeping up over time and I expect foils to retain good value. 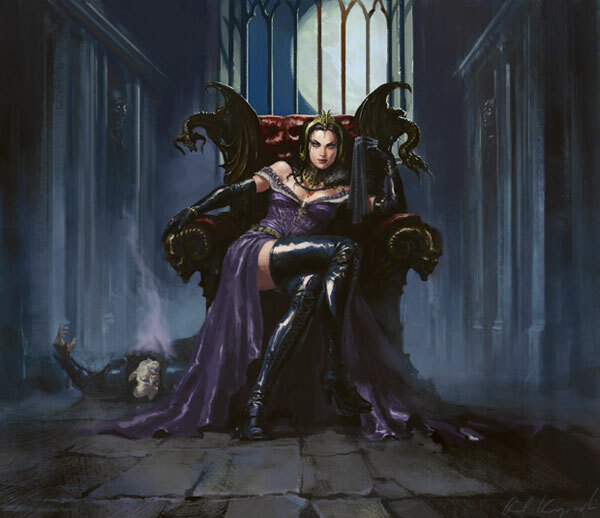 Liliana is right up there with Geist of Saint Traft in my top five from Innistrad block. Not only did this incarnation of Liliana see a $70 price at its highest in Standard, even now after rotation it has not dropped below $40. Besides Tarmogoyf and Dark Confidant, I expect Liliana to be a running staple in Modern for years to come. Though not played quite as often in Legacy, it can still be seen in plenty of archetypes to keep the price from ever going much lower. Holding onto Liliana will keep you very happy even just a year from now. I expect players to slowly acquire Liliana over time for Eternal format play. The price will go up with this demand. Olivia sees marginal play in a few Modern Jund builds, but otherwise has not done too much else outside of Standard. I believe that most of the reason that this card will rise over time is that she is a mythic rare vampire that is an amazing Commander card. These two factors, in addition to her potential tournament playability, increases her collectability and makes her a pretty safe investment. Past in Flames is a tricky target. Currently at bulk mythic prices ($2), I do not believe that the card can go any lower. Despite some players attempting to make the Past in Flames deck viable in Standard, it never made it mainstream. Pure spell-based combo in Standard was something that Wizards wished to avoid as a popular archetype. Even as a weaker Yawgmoth’s Will, Past in Flames is still powerful. That potential power is why I think that it will be good to hold onto moving forward. All it takes is one player, or even one new card to break this in Modern and make it more desirable. Because it is a mythic rare, the price shock could be quite surprising if this happens, potentially making the card $10+ overnight. I don’t know what the future holds in store for Past in Flames, but to me the pros of stashing my copies away outweigh the cons of bulking out. Though the checklands have fallen out of Standard and seen their price plunge because of this, moving forward it will be a good idea to hold onto them (or perhaps even start collecting them) in anticipation of Modern usage. The Innistrad checklands are unusual because they will follow a different path from the core set checklands. They only had one printing, as opposed to the multiple printings of the core set checklands, resulting in less severe devaluing than their core set counterparts. Each of them can be currently had for about $2-$3 a piece, which for now is still pretty good. They should slowly creep back up over time until they are reprinted again. I don’t expect them to be reprinted for a while, so until they do they will marginally increase over time. Even though this card is not Doubling Season, it is the closest we are going to get for a while. For years Doubling Season was worth no more than a few dollars, right up until Commander became a format. Casuals then snapped them up pretty quick for decks. Parallel Lives will follow a similar path and will increase in value as time goes on. I do not think it will see Doubling Season prices of $20 or more (foils probably will) but it will certainly gain value due to its casual demand. Another very flavorful card that I believe will retain casual appeal for a long time. This card allows for infinite combos in U/B Zombie decks and other shenanigans. It will only get better over time as more Zombies are printed. This card is definitely a sleeper. I don’t expect it to raise much over time until a powerful Zombie is printed that really pushes Rooftop Storm to the edge. You can feel very comfortable holding Snapcaster Mage after his Standard rotation. This is my number-one card for long term gains. He will see play in every format that he is legal in moving forward. Any deck that plays blue at some point considers if they want to run Sanpcaster. The best comparison I can make to Snapcaster is Dark Confidant. He will stay around $15-$20 for a while, maybe even a few years, but expect him to slowly creep up over time until he hits $40-$50+. The first uncommon that I am marking for long term gains. This is the most powerful uncommon from the Innistrad set, so I expect him to keep his current price of $1.50 and slowly creep up over time until he sees a reprinting. Casuals love this card because it is an efficient unblockable creature that they can Voltron while not worrying about whether their opponent will blow him up. He will not see Path to Exile or Spell Snare levels of increase, but will always trade well over time to casual players. Tune in next week for part 2 when we finish by looking at Dark Ascension and Avacyn Restored.